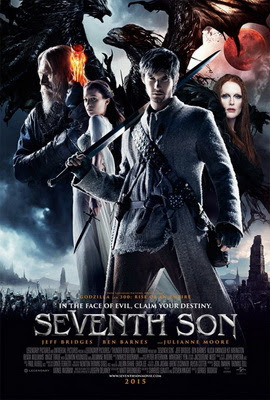 The YA aspect is provided by the new spook's apprentice, the seventh son-in-law Tom Ward (Ben Barnes), who, of course, falls in love with a teenage witch (half-sorceress, more specifically, the half-sorcerer's condition plays a crucial role entirely predictable part in the plot) who is the daughter of Moore's right witch. The usual complications ensue, but they are pretty easy to hide if you just want to go over the guys who fight against bear-men and swordsmen with multiple arms and a bald guy who can do ax blades when he's Not being a dragon. At such points, and especially during a cliff-dive-and-waterfall scene in which Tom collides with a very stubborn giant, "Seventh Son" accumulates the goofy charm of an old-school Saturday afternoon morning. Technological credits, as they call them in the trades, tell you why: the effects were designed by John Dykstra, an original Star Wars man, and the sumptuous artistic direction is from Dante Ferretti, who worked the magic for Fellini, From Palma and Scorsese. Olivia Williams and Djimon Hounsou are the welcome elements in the support cast, and the whole thing is over and done with a lot less than two hours. An imposing cinematographic realization? Barely. But not totally unsatisfactory if this particular kind of itching needs to be scraped.